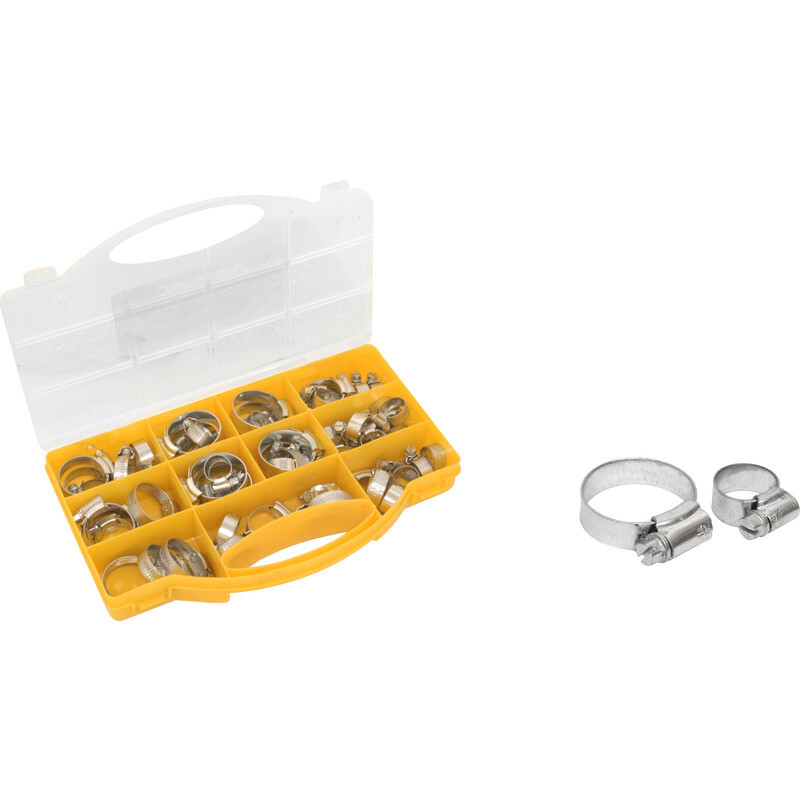 Selection pack of zinc plated hose clips in a portable carry case. Approx 60 pieces. Hose Clip Pack (60 Piece) is rated 1.9 out of 5 by 8. Rated 2 out of 5 by Knobhead from Not that good. Bought these to lengthen a pipe, when one of the larger one used, leak and worked loose. Rated 4 out of 5 by PeeTee from Useful multipack I only needed one but unsure of the right size, so bought this very useful multipack as a toolshed store item. Haven't had a chance to use 'in anger' yet, so don't know how they bear up under load. Rated 1 out of 5 by Apt1a from Poor quality Not a very good product. Poor quality, when trying to tighten the clips they basically just fall apart! The old adage springs to mind.............'You get what you pay for'! Rated 1 out of 5 by Jordan Tellalov from Poor quality I had to return the box - the first clip I used snapped even before I've tighten it enough! The little bended edges holding the screw "nut" were with cracks on probably half of all the clips. Rated 3 out of 5 by Whatwentwong from Emergency use Not great quality, but would get you out of trouble in the short term. Good assortment of sizes in a simple storage tray. Rated 1 out of 5 by Pete Pete from Cheap and nasty Come on toolstation, this is a below average product, cheap and not very user friendly. I would gladly pay more for a sturdier product. Rated 1 out of 5 by Webfox from Cheap hose clip set I bought this set of hose clips with a reasonable expectation, however when the first one failed, I lost faith. These clips are made of cheap soft metal, and if over-tightened, the metal slots that the screw grips, just buckle! This is nothing like the quality I remember or expect when relying on these types of clips.